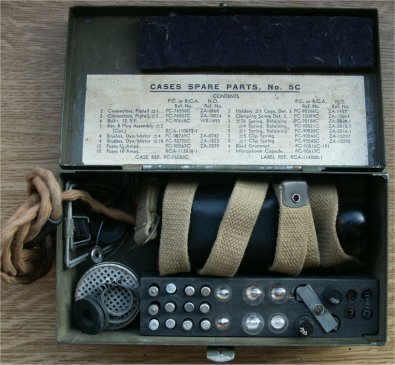 Every WS19 was supplied with a box, containing spare parts and a Morse key. Unfortunately, busy (?) Italian maintenance personal painted over the original markings. I tried to rub the green paint off, but that is a time consuming process! It is rather complete: a Morse key, a microphone capsule, fuses, pilot light bulbs, brushes for the dynamotors, rubber covers for the unused holes in the controlboxes, flick-screws, clamps, etc. You can take a close look at the the Morse key on the Morse key page.